South Side is a depressed area of Central Kingston, Jamaica, from which 13 men were taken, through subterfuge, and shot down by members of the defence force in the turbulent 1970s. It is the community in which Yvonne and Jerry are exiled when they fall in love and embrace the Rastafari doctrine as middle class youth join the search for roots when socialism, capitalism and Rastafari compete for their minds. 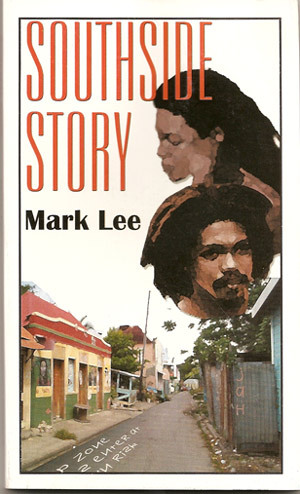 International and intra-Caribbean drug trafficking, espionage, reggae dancehall, Rasta celebration, diplomatic cocktail party hobnobbing and political intrigue are captured in this social history novella by Abeng News magazine editor, Mark Lee, whose other publications are Life in the Caribbean Community (1992), a journalistic compilation for the Caribbean News Agency and Vacation Barbados (1993), a destination guide for the eastern Caribbean island for International Voyager Media. He has also edited Elements of Regional Integration: The Way Forward, Ian Randle Publishers, Kingston, for the Caribbean Policy Development Centre, Barbados. His poetry has been published in the University of the West Indies’ Caribbean Quarterly, Flowers Blooming Late – a Montserrat anthology – and Dream Rock, a collection edited by Kamau Brathwaite for the Jamaica Information Service. Listen to a recorded excerpt describing a joint police/military mission into South Side, and then order your copy of the book right here.